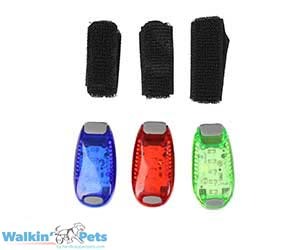 The Walkin' Light is an easy way to ensure your pet’s safety; you can see your pet’s wheelchair in low light or the dark. Add some “bling” to your pet’s ride! Ensure your special pet is visible when you are out and about. The Walkin' Light Attachment for the Walkin' Wheels dog wheelchair can be easily installed to the Walkin' Wheels frames. Video - See how the Walkin' Light works.